Barely ten years later, in 1906, there was a second major restoration under the direction of Rev J Francis Reece. Dry rot had affected the flooring, roof timbers and some of the pews. 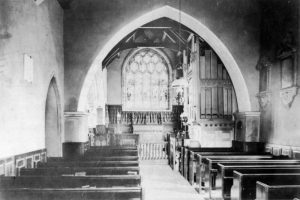 It was at this time that the doors from the box pews removed in 1896 were installed as a dado around the walls on the church, where they can be seen today. This restoration saw the installation of concrete floors, and the construction of a low wooden screen around the chancel on to which carvings from medieval times had been fixed. A pipe organ built by Bellamy of Denbigh was installed in 1910, in the main nave. The clock was installed, and the font cover. In 1919 the organ was moved to the north nave, beside the north door. It was removed in 2017. The commemorative plaque on the south wall of the chancel lists the names of fifteen men from Caerwys who were killed in the First World War. 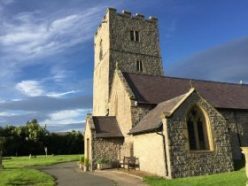 Among them were the two sons and the son-in-law of the Rector of Caerwys, Rev’d J. Sinnett-Jones. 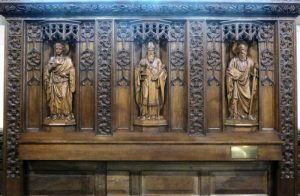 In 1919 Rev’d Sinnett-Jones and his wife funded the carving and installation of an impressive reredos, or carved screen, behind the altar in memory of his sons and son-in-law. Rev’d Sinett-Jones remained in Caerwys as Rector until he died in 1933. Another commemorative plaque, on the north wall of the chancel lists the names of four men of Caerwys who were killed in the Second World War. In 2009 John Evans retired as Rector. He planned the conversion of the north nave from pews to chairs to give more flexibility for services and other events. Rev’d Evans was the last ‘full-time’ Rector of Caerwys and Bodfari. In 2011 Venerable Chris Potter, Archdeacon of St Asaph became Rector, a post he held alongside many other responsibilities. For the foreseeable future Caerwys is to be the living of the Archdeadcon of St Aspah. It will thus benefit from the contribution of the most experienced and able of the clergy, albeit limited by the sheer scale of Diocesan duties.